The core banking activities of raising deposits from and providing credit to customers are crucial to Europe’s banks. Despite deleveraging by European consumers and businesses, bank deposits and loans grew in 2017. Domestic or euro area deposit liabilities in the EU rose by 3.1% to €23.6 trillion. This was the highest level recorded, with the previous peak at €23.1 trillion in 2012. Deposits from other Monetary Financial Institutions (MFIs) rose for the first time since 2011 to €7.1 trillion. Total deposits from non-MFIs, excluding central governments, grew by 2.5% in 2017 to €16.3 trillions in the EU at the end of 2017, with €12.1 trillions deposits coming from the euro area. Growth has been driven by an increase in deposits from households (including non-profit institutions serving households), which rose by 2.9% year-on-year to €9.1 trillion and non-financial corporations (NFCs), up by 6.7% to €3.2 trillion. The total value of loans outstanding from EU MFIs increased by 3.9% in 2017 to more than €24.5 trillion, surpassing the previous peak in 2011. The increase derived from growth in loans to other MFIs which rose by 9.8% year-on-year to €7.9 trillion. Loans to EU households rose by 2.5 % in 2017 to €7.8 trillion, rising slightly faster in the euro area. Loans to households in the euro area grew for the third successive year, adding almost €500 billion on loans outstanding since 2014. NFC loans outstanding rose by 0.7% in 2017 to €5.2 trillion, the highest level since 2013. Real estate activities, professional, scientific and technical activities and administrative and support service activities accounted for more than one third (35.3%) of loans outstanding at the end of 2017. Manufacturing and the wholesale and retail trades accounted for 14.3% and 13.2% respectively. Results from the quarterly ECB’s Bank Lending Survey suggested a broadly stable environment in 2017 for small and medium-sized enterprises (SMEs) and large enterprises. Despite some minor tightening of credit standards for SMEs in Q1 2017, results signaled a slight easing of credit standards i.e. banks’ internal guidelines or loan approval criteria, throughout the year for new loans to both SMEs and large enterprises reflecting the tendency seen in most quarters from the start of 2014. After reaching an all-time high net weighted percentage of 27.9 in Q1 2016, the demand for loans among SMEs remained broadly stable during 2017 closing the year with a net weighted percentage of 13.3. Demand for loans to large enterprises stabilize towards the end of the year from fluctuations seen in the previous quarters. Banks act as facilitators between those who have money and those who need money, while also providing the systems for funds to flow between payers and payees. The primary role of banks is to take in money from those with cash in hand and to lend money to borrowers. 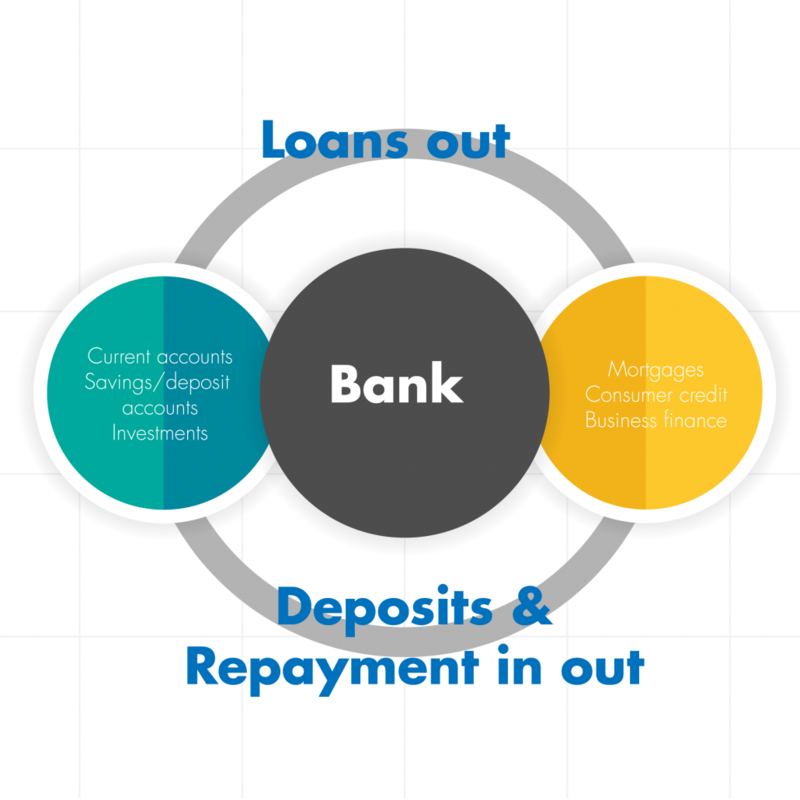 Banks then receive loan repayments which can be used in new lending to other borrowers. The traditional view of this process has been that banks “create” money by providing some of the money on deposit in the form of loans to borrowers, which returns to the banking system as deposits. This money can then be lent again and again, resulting in a multiplier effect. More recently, money creation has focussed on how lending creates bank deposits i.e. whenever a bank provides a loan to a customer, a deposit is created. Banks cannot lend freely without limits. They have to be able to lend profitably in a competitive market, while also managing liquidity risks (i.e. that they have sufficient liquid assets to repay depositors or investors when required) and credit risks (that some borrowers may not repay their loans). These lending activities are regulated and safeguarded by global/international standards and EU regulations. Just as money can be created, it can also be destroyed. For example, in the case of a mortgage being used to purchase a second-hand property, the purchaser could use the proceeds from the sale to pay an existing mortgage, effectively bringing the amount of money created back to zero. Banks are also key players in national and international payment systems. Some 122 billion cashless payments were made by non-MFIs in 2016 at EU 28 level. More than half (60 billion) of those were card payments, while about a quarter were credit transfers (31 billion) or direct debits (25 billion). The Single European Payments Area (SEPA) aims to harmonise and integrate payment markets across Europe, with one set of euro payment instruments: credit transfers, direct debits and payment card, common standards and practices and a harmonised legal basis. SEPA covers more than 520 million people in the 28 EU Member States and six non-EU countries (Iceland, Liechtenstein, Monaco, Norway, San Marino and Switzerland).